HAMMOND – The approval of the town and village’s community plan has been delayed for another month, council members said Tuesday. The town and village have delayed taking any action on its comprehensive plan until after its online public comment period ends. 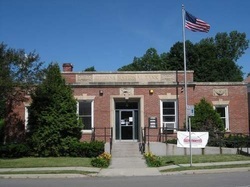 From now until Dec. 20, residents can view the and comment on the plan on the town’s website (www.townofhammondny.com). The plan has been updated to include revisions suggested at November’s town council meeting. The town council now anticipates the town and village’s community plan will be adopted in February, Town Supervisor Ronald W. Bertram said. The town and village have tentatively scheduled a joint public hearing on Jan. 9. But the plan will still need to be approved by a select committee of the county planning board before it can be adopted by the village and town, Mr. Bertram said. If the plan is approved, Mr. Bertram said the town council will form committee to ensure the plan is carried out. The Business and Economic Development Group, formed by Erica C. Demick and Michael Stock, hopes to serve as a liaison between businesses and government to help promote the goals of the town’s community plan, Earlier this year, the group compiled an online registry and database of businesses in the area. Ms. Demick said she has already begun working on developing community development projects in the community, and hopes to begin working on summer projects as soon as the committee is formed. “I do have a list of people that are ready and willing to get involved,” said Ms. Demick. CHIPPEWA BAY - Singer Castle has been named as a top destination by the state Tourism Council. Located on Dark Island in the St. Lawrence River off the town of Hammond, the castle was chosen as the eighth most exciting place to stay on the I Love New York’s Most Exciting Ways to Stay list this month. Built in the early 1900s by Frederick Bourne, president of the singer Sewing Machine Company, the castle was chosen for offering “a taste of the gilded age” and an “opulent hunting retreat,” according to the New York State Tourism website. Dark Island Tours is currently working with Canadian Sen. Robert Runciman, Leeds-Grenville member of Provincial Parliament, and U.S. Rep. William L. Owens, D-Plattsburgh, to establish a point of entry on Dark Island. “It would definitely help the region again, especially the Canadians that come from Brockville, who are right at our backdoor,” said Mr. Weldon. “Right now, many boaters have to stop at Alexandria Bay before they can come to the island.” Mr. Weldon said the company is also refurbishing its tea room, and hopes to open the room to the public next year for monthly teas. “It’s such an honor to have this distinction, and to be able to offer a wonderful bit of history for people that come on our tours,” said Mr. Weldon. For more information about Singer Castle, visit singercastle.com. HAMMOND – Community members are looking to form an economic development council to streamline business growth and promote the town’s community plan. The Business and Economic Development Group on Tuesday asked Town Council members to form a committee that would serve as a liaison between businesses and government to help forward the goals of the town’s community plan. Erica C. Demick and Michael Stock founded the Business Development Group in order to promote business recognition, growth and development in the Hammond and Chippewa Bay areas. Earlier this year, the group compiled an online registry and database of businesses in the area. They raised approximately $1,700 from businesses. Approximately $500 went to website design and the remaining $1,200 will be put in a fund to be managed by the new committee, Ms. Demick said. The money will be used to market Hammond and Chippewa Bay and possibly replace the existing entrance sign in Chippewa Bay, Ms. Demick said. “There’s been some discussion on hiring someone,” said Ms. Demick. “But we think we can get enough volunteers to start. We’d like to have seven members: one person from the planning board, one person from the council and several members of the community involved.” The committee would meet once a month. “This is not set in stone,” said Ms. Demick. “This can change based on the committee’s input.” According to St. Lawrence County Planning Office officials, the community plan will be put in final draft form in mid-October. Residents of Hammond can view the plan and still make changes before next month. It is posted online at www.co.st-lawrence.ny.us/Departments/Planning/. HAMMOND – The Citizens National Bank of Hammond is celebrating its 100th year in business this year and, as any staff member will tell you, that is no small feat. As the smallest bank in the area and the second smallest bank in the State of New York, Citizens National Bank has outlasted many area banks that have gone in and out of business over the years, according to President, CEO and CFO Schelin M. Crosby. 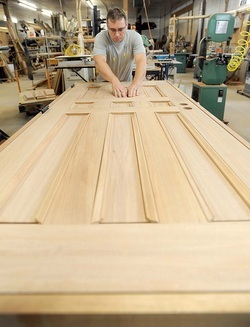 Jason Butterfield puts decorative molding on a mahogany door at Vintage Doors, 66 S. Main St., Hammond. Photo by Melanie Kimbler-Lago. Between 1960 and 2009, three of every four manufacturing jobs disappeared in the state, according to a study by the Manufacturing Research Institute of New York State. But while total manufacturing employment nationwide declined by about 32 percent in the decade ending in 2009, the year the study was completed, New York State still remained a national leader, ranking sixth in overall manufacturing employment, U.S. Bureau of Labor Statistics data reveals. There were 18,888 manufacturing firms operating statewide in 2009, the state Labor Department reported. The average plant employed 25 people. One of those sectors was wood product manufacturing, which had employed 11,078 people statewide in 2000, declining to 7,071 in 2009, a decrease of more than 30 percent at the time when the nation’s economic recession was in full swing, the study showed. But several family-owned wood product manufacturing companies in the north country have been able to survive and in some cases, even thrive during the economic recession. They have beaten the odds with varied business strategies. Some have capitalized on lower machinery prices, a result of the shutdown of similar business operations outside the area. This has allowed for expansion of product lines, while at the same time, not sacrificing the quality of their work. Others have been able to hire experienced workers laid-off from the companies that have closed their doors. Yet at the same time, many north country businesses have strived to keep their own highly-skilled employees, regardless of the demand for their product. Perhaps most important, they were able to depend on their well-established reputations to get them through the tough times. “The economy has been scary for a number of years and we are very careful in trying to determine what event will be detrimental to expansion or daily operational activities,” said Howard W. Demick, president and general manager of YesterYear’s Vintage Doors. The vintage door company was started in 1990 by Mr. Demick, who initially operated it with only one other employee. Today, the company ships custom made vintage doors to customers nationwide and employs five shop workers and four office staff. His wife Rosemary, a graduate of SUNY Geneseo with an English degree, and his two children, Ryan and Erica, who both graduated from Clarkson University with business degrees, are all involved in the business operation.